For the next few weeks I’m working my way through a massive bulk lot, filled with bulk LEGO and around 80 sets. I’m planning on building them all, giving them a quick review, and telling you all about the interesting parts I find. You can read Part 4 here. ​I’ve built a few more of the Aqua Raiders sets this week, and they’ve been pretty great. Lobster Strike is the first set you get with a big monster – this time it’s a monster lobster. 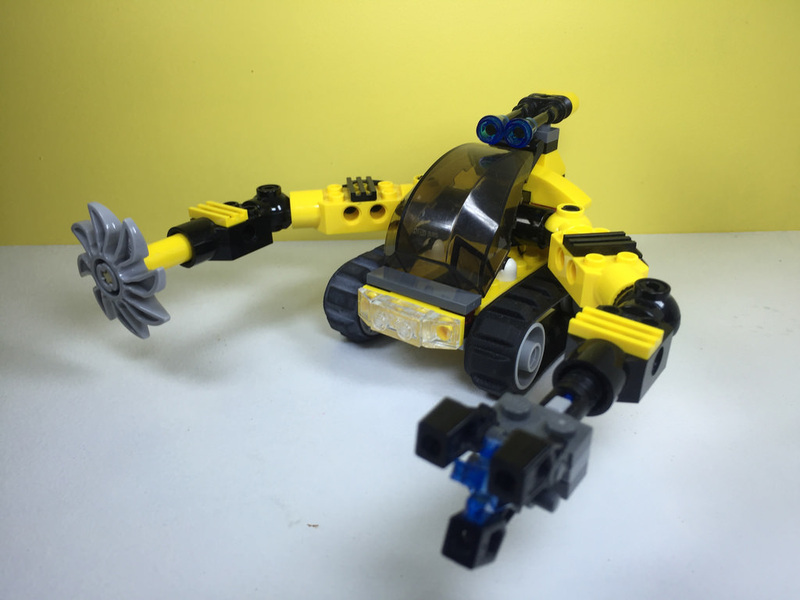 The Aqua Raiders get an interesting caterpillar wheeled vehicle, with grabbing and cutting arms. It looks pretty cool. In all of the sets of this theme, there’s plenty of yellow and black, but this set gets some nice red elements in the mix. This set introduces two new bowed bricks with print for the lobster’s shell. a 4×2, and a 4×4. There are eight red tail tips, which were new at the time, and a dark red spiked tail (both of which are still very hard to come by). There is some serious playability here. It’s awesome. The lobster’s claws are movable (albeit not in every direction), as are the legs and tail, and the vehicle has a lot of moveability as well. Endless hours of fun! The first thing you build is the vehicle. It’s pretty quick to put together (providing you have the parts, but is simply one on top of the other. It’s a simple build, but looks pretty cool once it’s finished. 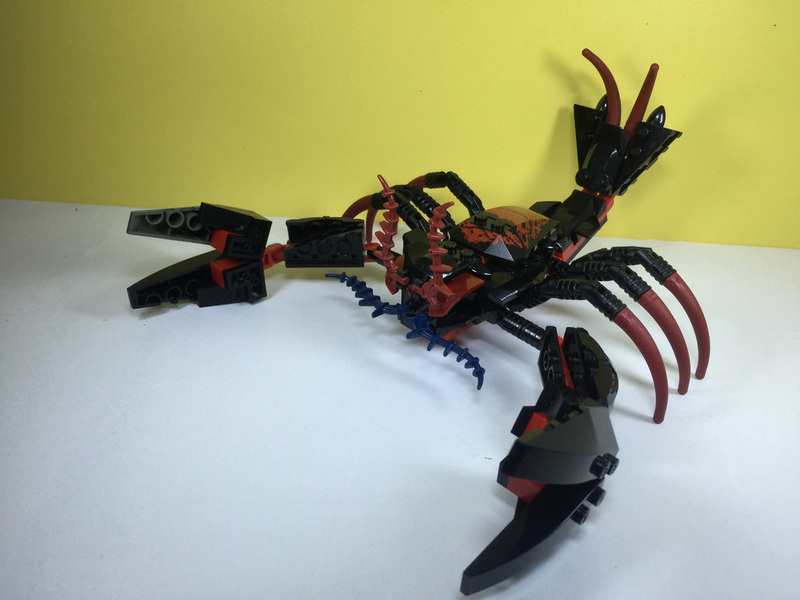 While the build of the lobster comes together pretty simply, it’s let down in part by the fact that the legs of the lobsters (the red parts in particular) are constantly falling off! This may be due to the age of the plastic, but I doubt it, seeing as it’s not that old. I’ve read a few other reviews that have experienced the same thing. It’s only really two of the ones I have, but it’s still irritating. Apart from that, the lobster is well put together, and pretty strong. 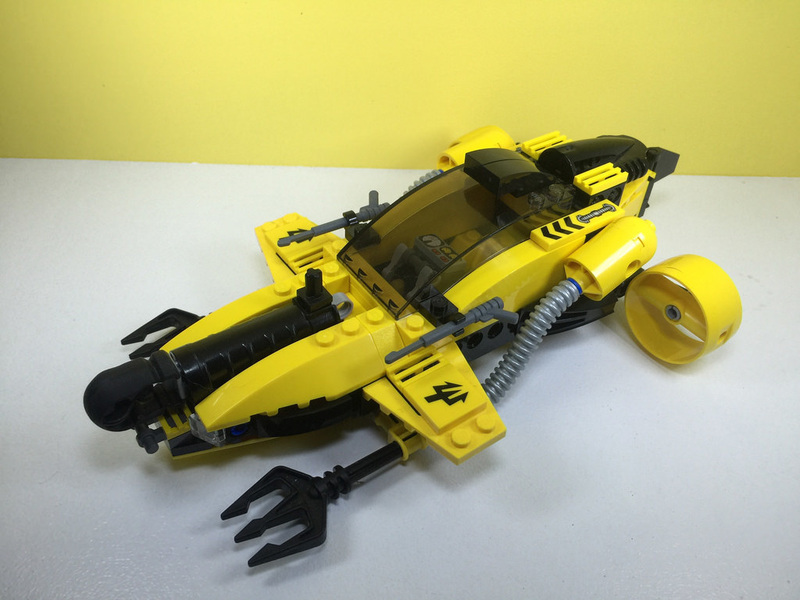 This is one of those builds that makes you realise how versatile LEGO really is. It’s great to see a very recognisable lobster. It’s also able to stand on it’s feet, without having to rest on it’s body or claws. The vehicle looks cool, but there are massive holes on each side which would definitely let the water in! I don’t understand why it wasn’t sealed up. Aside from that, it a cool looking vehicle, especially with that big saw and grabbing hand. You can pick this set up on the second hand market for a pretty good price. They are going for about $25, which means the price per brick is pretty great, at around 15c. For a set that’s as cool as this one, it’s definitely worth it. Again, with all the Aqua Raiders sets, there aren’t many of them, so it’s worth collecting the whole theme. Tiger Shark Attack is exactly that. A massive Tiger Shark coming to eat some Aqua Raiders. It’s actually the first set I built from the theme, and I was very impressed. Lots of yellows, blacks and greys in this set. There are two big tridents on Technic axles, some nice yellow turbines and that printed shark head, to name a few elements. 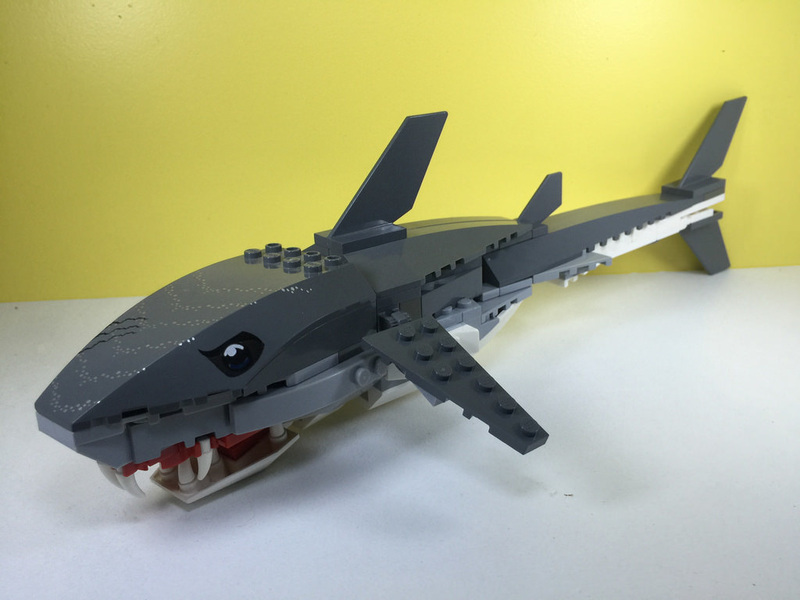 There are also a lot of bricks with bows and angles, and some different size rudders, used as the fins for the shark. This set has everything. Specialist parts, and standard. That shark is great fun to play with. I’ve already made it swim around my living room, threatening to bite the cat (she didn’t appreciate it). It’s got a little bit of articulation at the neck and tail, so it can bend a little, but not that much. It doesn’t matter though, it’s still great fun. The submarine is also great fun to swoosh around. The cannon at the front of the vessel shoots the projectile pretty far – I was very impressed. This is a very swooshable set, one that kids (and adults) will have endless hours of fun with. The first thing to build is the simplest – the rock and treasure. Very, very simple. Next up is the big mounted speargun. This is a simple build, but looks great. It looks fantastic. Next up is the shark. It’s really good to build, and every time a section is added, the excitement levels just go up and up. There are some SNOT techniques in the build, as well as some hinges and some interesting Technic work. Finally, the submarine is put together. While it isn’t the most advanced build, it is still extremely enjoyable, and ends up being a very cool looking vessel. The extra features like the hoses mean a very fun build experience. There are so many great features to this set. The mounted speargun, the slick looking submarine, and that shark amount to a very cool looking set. It’s a bit of a pity the articulated points in the shark mean there need to be holes, but it’s worth it. I particularly like the red elements for the shark’s gums. It shows that the designers put a lot of thought into this set. The value for money with this set is a little sketchy, as for a used set you’ll be looking at forking out around $40. It’s an extremely collectible set, as the theme was a limited run, with some very cool builds. The price is on the rise, so get it while it’s relatively well priced. I had a great time building this set, and it got me very excited for the rest of the theme. Well worth picking up if you can! This set is a little different from the rest of the Aqua Raiders theme. As the last in the theme, it looks like the characters have found their long lost treasure, and are about to retrieve it. Due to this set’s difference to the rest of the theme, there are a few extra elements that are worth noting. Firstly, this set uses magnets as grabbing tools. While they aren’t new to the LEGO system, it’s always a little exciting when they are used. 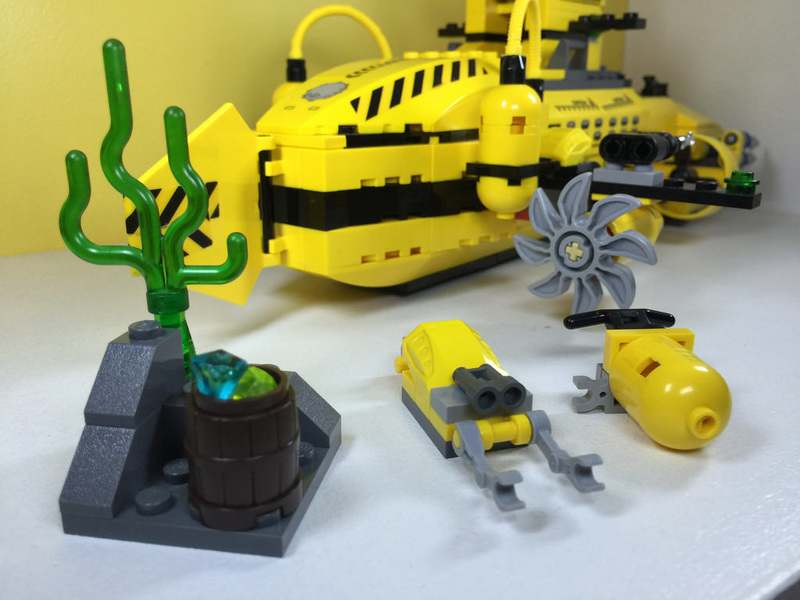 This set also introduced a new baseplate (the 8×16 in brick yellow), as well as has a couple of ship elements, including the mast, and ship’s wheel. Finally, there’s the brick with arch in brown, which you get nine, and the beautiful glass dome for the submarine. I’m very impressed. This set is once again, very swooshable, like all the Aqua Raiders sets. The submarine’s magnetic arms are great fun, and there’s also a nice functional aspect in the shipwreck. Slide the treasure box forward, and the mast will fall down. It’s very clever, and an aspect I was not expecting. 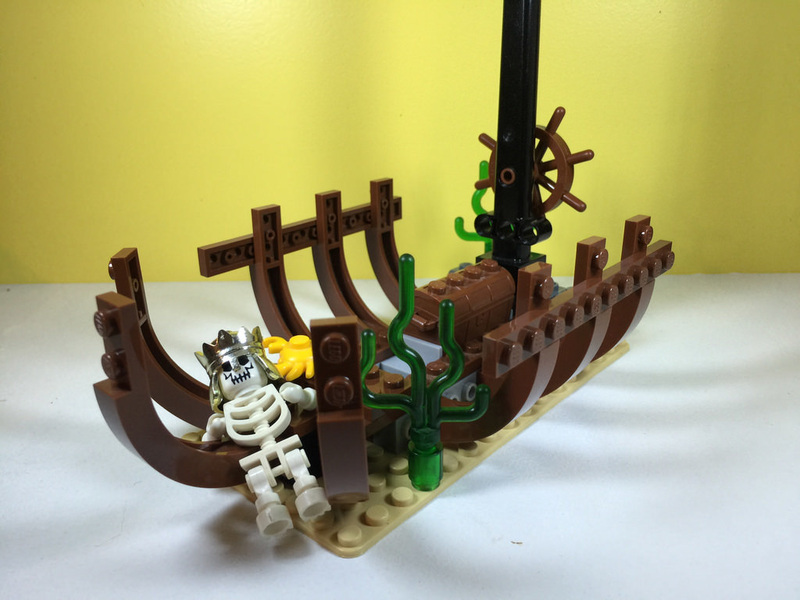 After getting the treasure and skeleton together, the first step is the shipwreck. There are some basic SNOT techniques at work here, which mean the final result looks pretty great. Finally, there’s the submarine. It’s 99% bricks on bricks, but is highly enjoyable to build. The extra parts of the arms and weaponry add so much more to the build, although it did take me a while to get the arms together! Sorting through the massive pile of black is a feat of endurance. Don’t get me started on the grey pile! 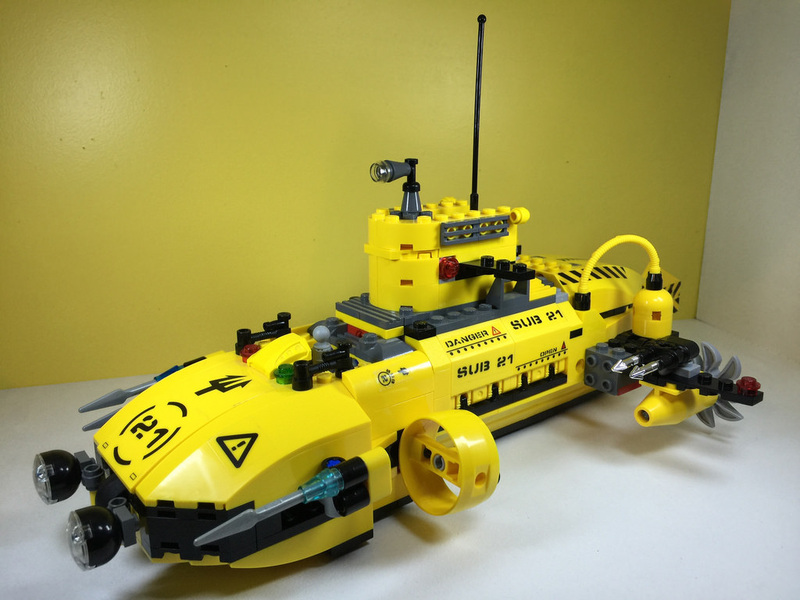 The submarine is missing an arm and the spearguns, but it still looks great. The set is beautiful, and is easily recognisable, but I’m not sure what high tech treasure boxes are doing at the bottom of a shipwreck. By the looks of it, the ship has been there for a while, but those locked treasure boxes are very advanced. That’s the only gripe though. It really is a great set! 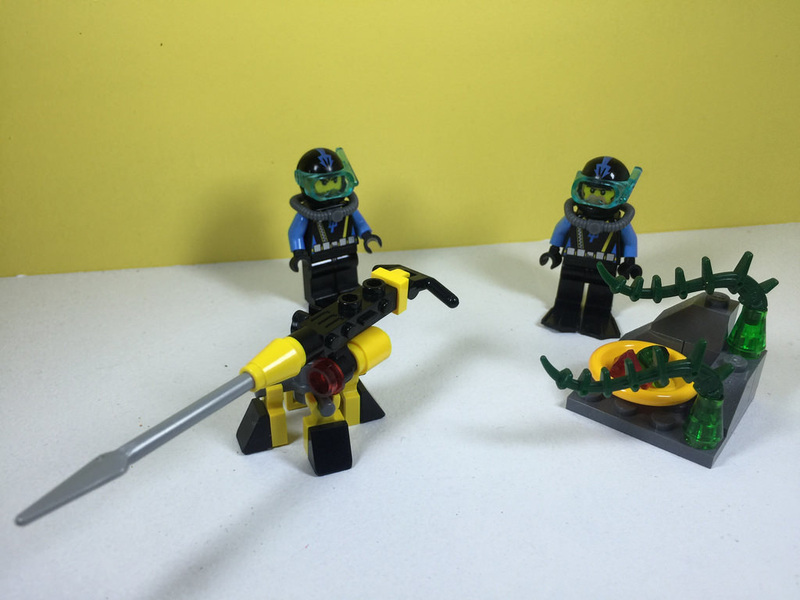 The minifigures, like in all the Aqua Raiders sets, are great to look at. Some very nice detailing. This set is the most expensive so far for the Aqua Raiders sets in terms of current sales. You’ll be expecting to pay close to $60 for this used, meaning closer to $90 for a new one. The price is on the rise, so get it while you can. Again, it’s very collectible, especially if you’re going for the whole theme. 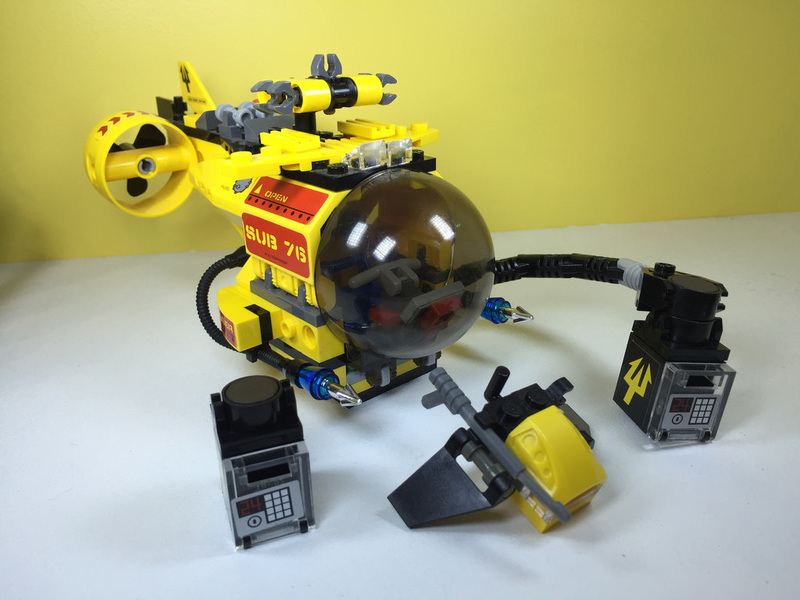 This set introduces the biggest submarine for the Aqua Raiders. Up against it is a big monster crab. Should be fun! Lots of yellow in this one! 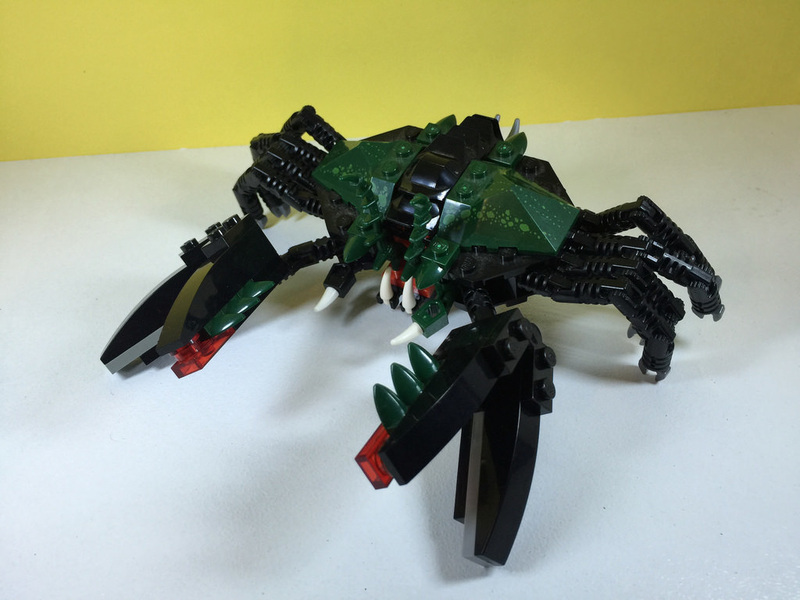 The elements in the crab are particularly good, with lots of articulating elements for the legs, and the shell of the crab being a green printed roof tile. There are plenty of curved and round elements in the submarine, as well as hoses and weapons galore. The crab can move around a fair bit, with those articulated legs. The submarine is pretty neat. The firing mechanism is great, and the interior is easily accessible, with plenty of play elements and room. There are lots of details to check out inside, and it also has a little scouting drone thing that comes out of the centre. It’s a great set. After putting together the tiny elements, the crab comes first. It’s pretty cool to put together, and also quite strong once built. The submarine is built in three parts, and then clipped together. It’s great fun building it, with some nice SNOT techniques here and there. It’s also big! It would be great to display on a shelf, or have in the toybox. I can’t fault the submarine. It looks brilliant. The hidden torpedo at the front is fantastic, and it looks like a mean vessel. I love it. Easily my favourite vessel in the whole theme. The crab is great too, but I feel that it’s eyes should be more bright. It also doesn’t stand up by itself very well. It tends to fall forward and rest on it’s claws. No matter how I position the legs, it doesn’t seem to like it. If the legs had more forward and back motion instead of just up and down, it would help. This set is great value for money. It’s fetching around $50 on the market as used at the moment, with around $85 for the new sets. It’s reduced in price, and the price per element is very reasonable, hovering at around 15c per element. Definitely worth getting now! I’ve got one more set to come for the Aqua Raiders (the big base), then it’s time for something different! We’re getting through the sets slowly, but it takes time to go through the piles of colours scattered around the house. Plenty more to come!